In stock -This product will ship today if ordered within the next 8 hours and 11 minutes. ThinkKrill Joints is specially formulated to contribute to normal collagen formation and the normal function of bones and cartilage. A range of Omega-3 Krill Oil supplements specifically formulated for different lifestyle categories. Krill Oil (Euphausia Superba), Vitamin C, Soya Bean Oil, Beeswax, Capsule Shell (Gelatine, Glycerin). Not suitable for people with allergies to shell fish or fish products. Do not take this product if taking blood thinning medication (anticoagulants). Consult your doctor before taking this product if under medical supervision, on medication or pregnant. 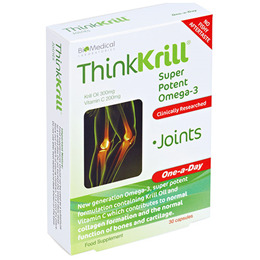 Below are reviews of ThinkKrill Joints - Super Potent Omega-3 - 30 Capsules by bodykind customers. If you have tried this product we'd love to hear what you think so please leave a review.